For at least 15 years, the NLM has recommended performing the Heimlich maneuver on unconscious choking victims based on information provided health information provider A.D.A.M. Inc. 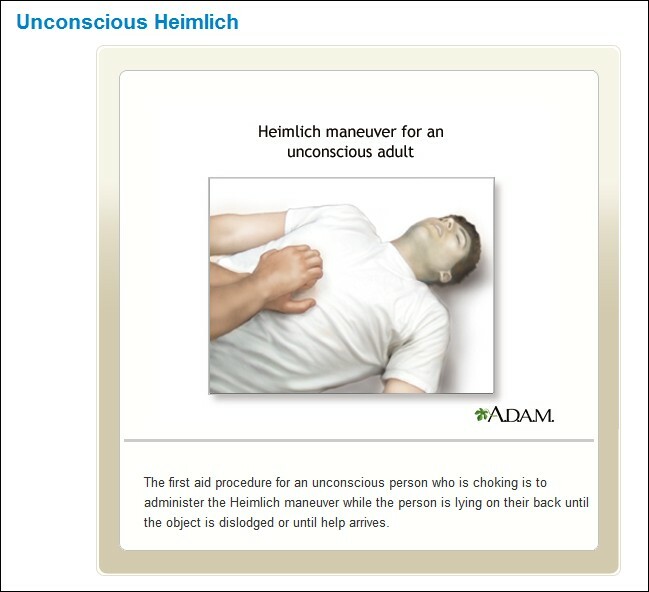 The use of the Heimlich maneuver to revive unconscious choking victims is reportedly not recommended by the American Heart Association or the American Red Cross, and I'm unaware of any research in which the treatment has been tested, so in recent months I've attempted to learn the basis for the NLM's recommendation. In years 2000, 2005, and 2007 the information was reviewed and approved by this series of physicians who presumably were hired by A.D.A.M. So on what evidence did he -- and the other doctors -- approve the treatment recommendation? After receiving Dr. Perez's reply, I received a January 16 e-mail from Isla Ogilvie PhD, A.D.A.M. 's Strategic Content Director, informing me the information was being reviewed. Did A.D.A.M. research the literature on the subject of "the Heimlich" for unconscious choking victims? If so, would you please send me citations to any relevant articles or studies? 1) This is to respectfully request that your offices review the following information and provide me with a determination whether or not the treatment recommendation meets the standards of your agencies. 2) If the treatment recommendation does not meet those standards, this is to respectfully request that your offices investigate how the information came to be published on the NLM website; the basis for A.D.A.M. 's recommendation of the treatment for at least 15 years; all details regarding URAC's review of the information; and that I be provided with the results of those findings. I'm also looking into how much the NIH pays A.D.A.M. and will report the results.